I had no idea but found out about this today! The advertising industry is becoming more inventive, when it comes to the dog food at least. Of interest is the most destinctive sense of the dog, the sense of smell, intended to drive the dogs to the billboards. There was initially a trial in North Rhine-Westphalia, and after it is finished, it will soon be found in big cities. 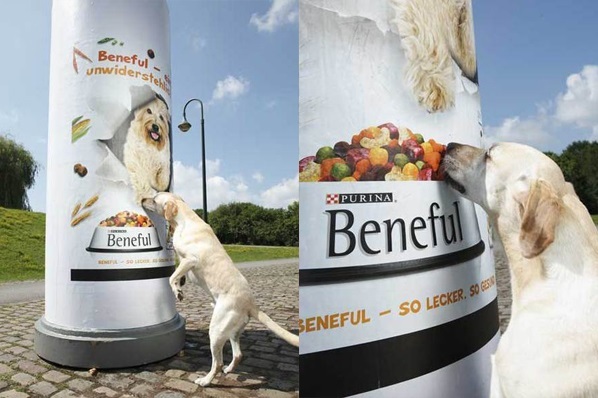 The principle is really quite simple, the dog sniffs at the poster, and the dog owner is made aware of the brand. By 26 August, among other things, in Berlin, Frankfurt and Munich, these scented posters were hung, all of a particular brand of food. If you think you can smell the scent, think again... only if you go up right to the billboard to do so! Smart advertising! I guess we'll see them in Moscow in a few years, too. So, dog owners whose dogs are most inquisitive, are most likely to be aware of every new food novelty, hehe.